Rice Krispie Nests: a quick and easy no-bake Easter treat! 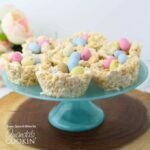 If you’re looking for a quick and easy Easter dessert, or a fun Easter activity to keep the kids busy, these Rice Krispie Nests are a delicious choice! 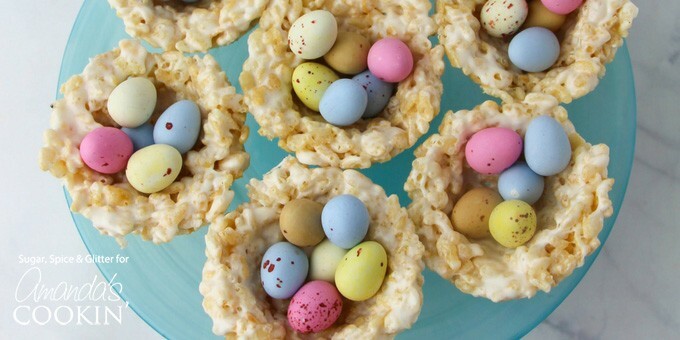 Rice Krispie treats are shaped into little nests and filled with chocolate candy eggs. If you need another cereal based treat, these Funfetti Marshmallow Cereal Bars make for delicious Easter goodies as well! While I love baking with my daughter, sometimes it’s nice to have no-bake options available when the oven is in use for something else (like an Easter Ham or Sunday roast) or when you just want to make something low-key without having to wait for the oven timer or heat the house up. This fun and easy Easter treat combines two childhood classics – rice Krispie treats and mini eggs! We love making seasonal rice Krispies, and they are super easy to customize to any occasion – like our Mickey Rice Krispie treats or our Beauty & the Beast Rice Krispie treats. Kids can practice counting out the eggs, have some sensory fun squishing the nests into shape, and get a good arm workout stirring up all of that cereal and marshmallows. It’s a great activity to set out if you’ll be entertaining a large group of kids on Easter, keeping them happy and working together while the grown-ups catch up. These Rice Krispie Nests are also a great option for a classroom treat and your child will feel so proud that they were able to help with every step of the recipe. While we used vanilla and coconut oil, you can customize these treats however you like. Use cocoa pebbles for chocolate nests, or maple extract for an unexpected flavor twist. 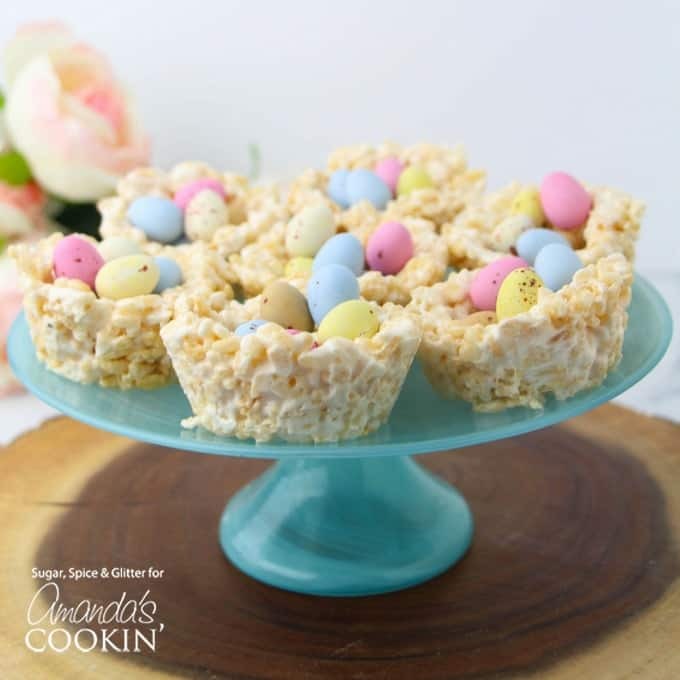 Do you have a special Easter occasion you would make these no-bake rice Krispie nests for? What are your favorite recipes for involving little hands in the kitchen? If you’d like more awesome Easter treat ideas like these Rice Krispie Nests, check out these Frosted Sugar Cookie Bars, iced with beautiful pastel colors that are perfect for Easter! Of course, our classic chocolate lasagna is never a bad idea if you’re looking for a no-bake Easter desserts. 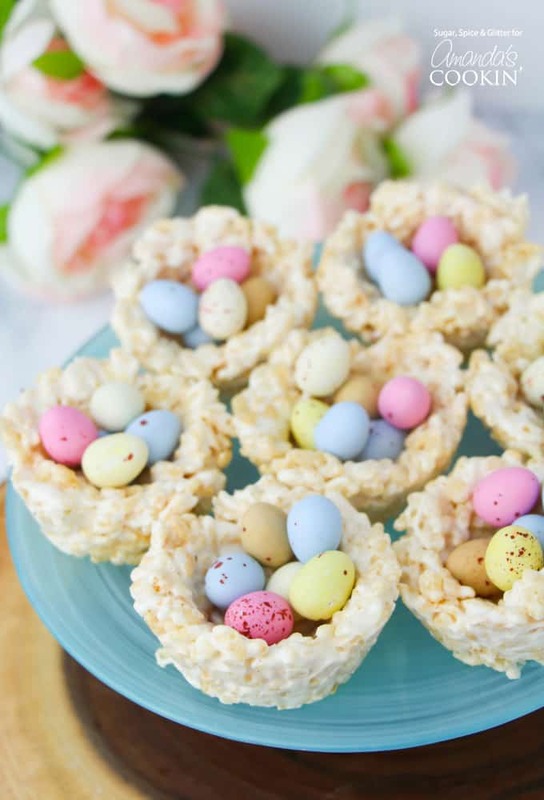 These Rice Krispie Nests are the perfect no-bake Easter goodies! They are great for the kids to take to school or to impress your coworkers. Grease a 12-cup muffin tray and set aside. Place the marshmallows in a large microwave-safe bowl and heat for 25-30 seconds. Stir well, and repeat heating as needed. Add the melted coconut oil and vanilla extract to the marshmallows and stir well to incorporate. Add the rice cereal cup at a time, gently folding it into the marshmallow mixture, until all of the cereal is incorporated. Scoop heaping 1/4 cup portions of the rice krispie treats into the prepared muffin tray. Wet your hands and press the rice krispies into a cup or tart-shape. Place in the fridge for 2 hours or overnight to set. When the nests have had a chance to set and harden, pop them out of the muffin tray using a butter knife and fill with treats. We used mini eggs but jellybeans or a some berries would also be delicious. This post originally appeared here on Mar 8, 2017. Do the nest get hard or do they stay soft and chewy? They stay soft. But if you put them in the fridge you’ll want to bring them out to room temp to soften up again. is the vanilla extract vital? a pregnant person will be eating it, and I’m not sure if someone who is pregnant can have uncooked extract. thanks for the cute recipe! I’m sorry this is a late response, I didn’t see your comment until now :( But it should be left in the fridge overnight! Did you use mini marshmallows or regular sized? Thanks for this! These were a Pinterest success for me, and my sons’ preschool class loved them (both kids and parents)! Did you use a regular sized muffin pan, or a mini muffin pan? How many did it make?